Screenshots Linux long ago reached parity with Windows and OS X. That's great for the average user looking to make the switch from either platform to Linux. 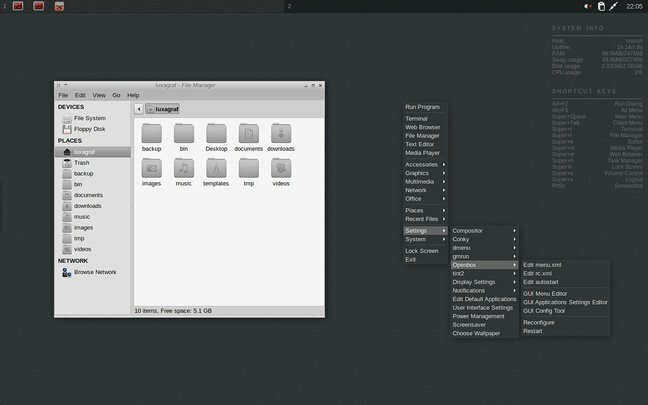 Indeed distros like Ubuntu, with its Unity desktop, make switching relatively painless. All of the common tools most users want in Windows are also available in Unity, GNOME and other Linux desktops, whether that's music players, office apps, photo editors, web browsers or video players. But some users aren't after feature parity. In fact, if you've got older hardware or are running a server, or don't need all the "features" in today's desktop environments, projects like Unity or GNOME Shell are overkill. Worse, all those features could render your older hardware nearly unusable. Luckily, there's a whole other world of Linux. There are dozens of smaller distros that specialize in lightweight desktops that do the basics – manage windows, and offer file browsers, launchers and sometimes a menu bar of some sort – but otherwise stay out of the way. The point, after all, is the applications. Why waste RAM running a fancy desktop when all you want to do in interact with the apps you're running? If you have the RAM to spare, well, sure, why not? But not all of us do. I became interested in lightweight desktops when I got an EeePC that, while quite capable (I wrote this article on it) has just 2GB of RAM. Install Ubuntu with Unity on the EeePC, and you'll be using 770MB of RAM just idling. That's well over a third of the available RAM before you so much as open a file browser. Eventually I discovered even lighter "desktop" options like Openbox. Openbox is not really a desktop, it's a window manager, but when paired with other tools like a menu bar and file manager, it can form the basis of a very fast, lightweight desktop. Using Debian Minimal as a base, installing Openbox, Thunar and Tint2 got my memory use down in the double digits. There are ways to make an even lighter weight desktop – for example, you could ditch the file manager and do everything from the command line – but at some point there are diminishing returns. The RAM you save from ditching the file manager may not be worth the time you lose working without a drag-and-drop interface to manage your files. While I set up Debian Minimal and experimented with Arch, I eventually settled on Crunchbang, a nicely configured Openbox setup based on Debian. If you want to tinker with every little thing, doing it yourself is the way to go. If you want a nice looking, clean, simple setup that doesn't require three days to get right, a lightweight distro like Crunchbang is the way to go. Earlier this year, however, Crunchbang's lead developer threw in the towel –running a Linux distro, even a small, lightweight one, is no small undertaking. Though my version of Crunchbang Waldorf (the last official release) continues to run just fine some bugs surfaced when I tried to update to Debian 8. So I started looking for alternatives. Before I dive into these alternatives, let's start with the community project that came out of Crunchbang's demise - the cleverly named Crunchbang++. The project recently put out a 1.0 release, which is largely Crunchbang Waldorf with some theme improvements and updated to work with Debian 8 Jessie. The result is pretty much the Crunchbang you've always loved. The theme updates are minimal, Crunchbang++ retains its predecessor's clean, simple look with monochrome icons and minimal color throughout. Openbox is still the basis of the desktops with Tint2 providing a menu bar and Thunar (also a part of Xfce) serving as the default file manager. In short, this is the Crunchbang you've been looking for. With the update to Debian 8 you should be able to get at least a couple more good years out of Crunchbang with Crunchbang++ 1.0. That said, it's much easier to put together a distro shortly after the demise of another, when enthusiasm for continuing the project is high. Whether or not Crunchbang++ can maintain this momentum over time remains to be seen. While I'm optimistic that it can, I also prefer not to put all my SSH keys in a single basket as it were.